Sailfish Splash Waterpark always has a cool special just for you! 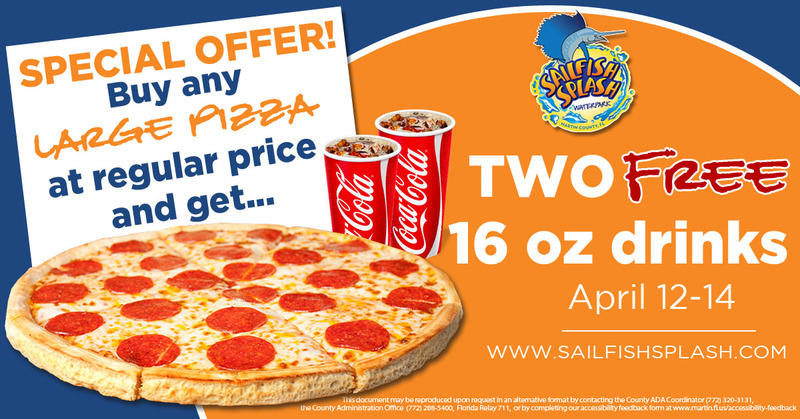 From April 12-14, 2019, buy any large pizza at the regular price and get two (16-ounce) fountain drinks FREE. Visit us at the concession stand at Sailfish Splash Waterpark located at 931 SE Ruhnke St., Stuart, FL. The state-of-the-art complex is conveniently located in Stuart, Florida, just East of Willoughby Boulevard on SE Ruhnke Street and North of SE Indian Street.